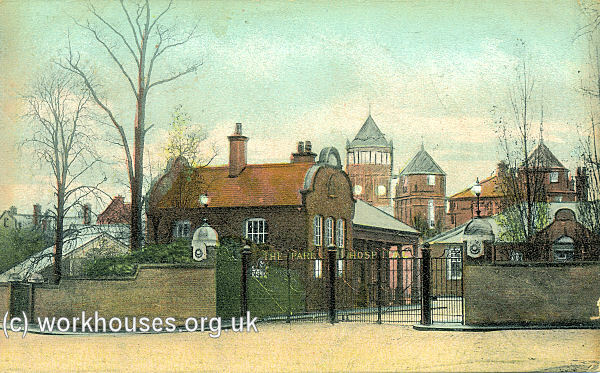 Hither Green, near Lewisham, was the location for one of the final group of fever hospitals erected by the Metropolitan Asylums Board in the 1890s. 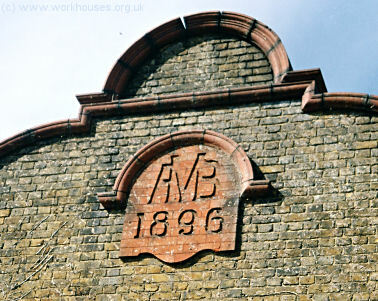 The MAB had been set up in 1867 to administer care for certain categories of the sick poor in metropolitan London. In 1891, its responsibilities were expanded to include the provision of fever and infectious diseases hospitals for all the capital's inhabitants. An acute shortage of beds during a scarlet fever epidemic in 1892-3 led to the construction of five new fever hospitals beginning with the North-Eastern Hospital at Tottenham in 1892, the Fountain Hospital in Tooting in 1893, and the Brook Hospital at Shooter's Hill in 1896. The fourth of these, the Park, was officially opened by the Prince of Wales on 12th July, 1897. It was then the largest fever hospital in the country with 548 beds and a staff of 300. Its construction cost around £280,000. 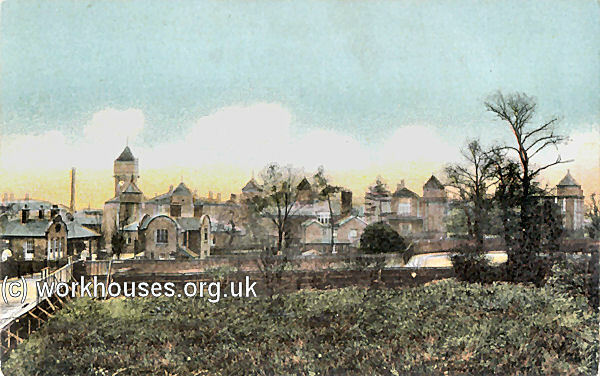 The site for the new hospital, some 20 acres in size, had an elevated location and had previously been occupied by a large house and its grounds. The design for the buildings was opened up to competition with the brief specifying large 20-bed wards for scarlet fever patients, and smaller wards for enteric fever and diphtheria cases. Isolation wards, receiving and discharge rooms, staff quarters, laundry, boiler house, and other service buildings were also to be included. An important requirement was that various wards should be isolated from one another to prevent cross-infection. The architect chosen for the scheme was Edwin T. Hall. His design was praised by The Builder in June 1894 as 'one of the best examples of planning with a specified purpose that we have met with'. As well as fulfilling the functional requirements for the design, Hall had also, in his own words, 'tried to attain quiet dignity and reposefulness with pleasant detail' and had retained most of the trees surrounding the site. Park Hospital from the north, 1897. The Park's irregularly shaped site sloped considerably from east to west and, at its northern side, had a curved frontage onto two main roads, Hither Green Lane and George Lane. The hospital entrance buildings were placed at the junction of the two roads and comprised a two-storey porter's lodge, medical superintendent's house, office, discharge and waiting rooms, mortuary, and medical education block. Park Hospital from the north-west, c.1913. 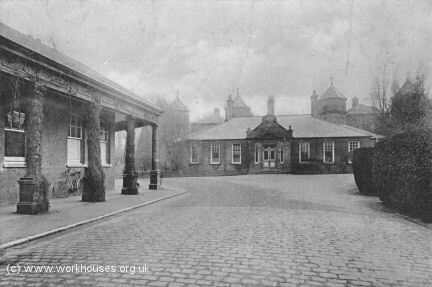 Park Hospital entrance from the north-west, c.1913. 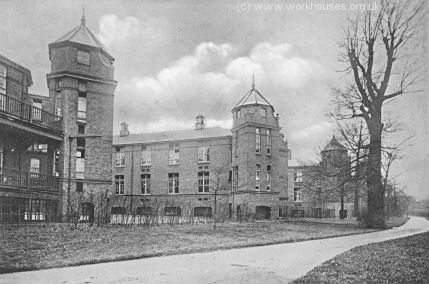 Park Hospital from the north-west, c.1906. Park Hospital main entrance, c.1908. The central administration buildings were located to the east of the entrance. The three-storey H-shaped block at the front included accommodation for female servants. 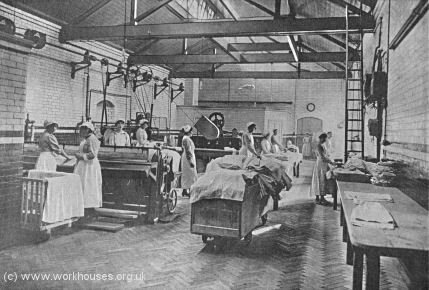 A separate block to the rear contained the hospital's kitchens, stores, and male servants' quarters. Houses for the Assistant Medical Officer and Steward lay to each side of the administration buildings. Park Hospital administration block, 1897. 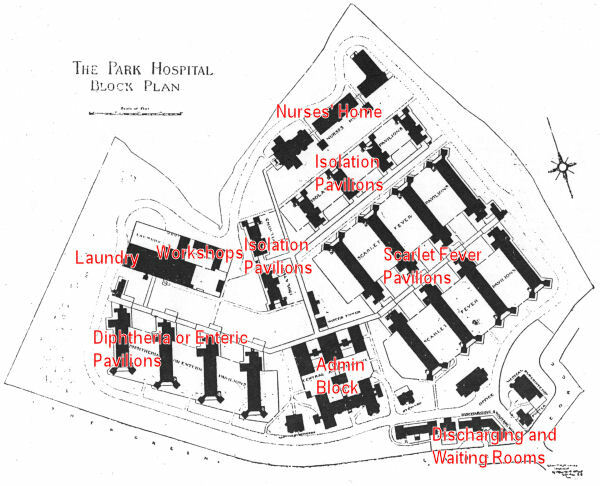 The eight pavilion ward blocks for scarlet fever patients were placed in pairs at the west of the site, while the four slightly smaller ones for diphtheria or enteric fever cases were located at the east. All the blocks and the administration buildings were linked by a covered walkway. The ward blocks all followed the same basic arrangement of two storeys, with no internal communication between them — the upper floor being accessed from the covered way by an external staircase. 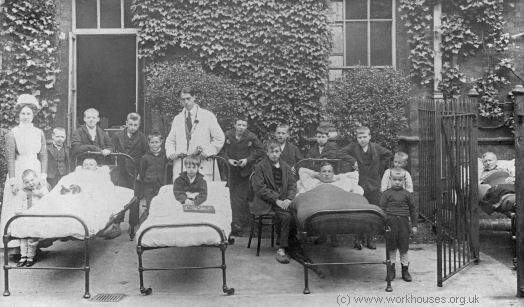 The scarlet fever wards each had 20 beds plus two side wards, one single-bedded and one twin-bedded. 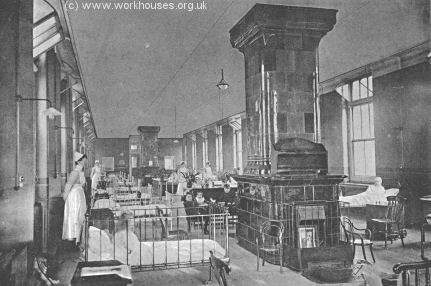 The single-bedded wards were also intended for accommodating any staff who became infected. 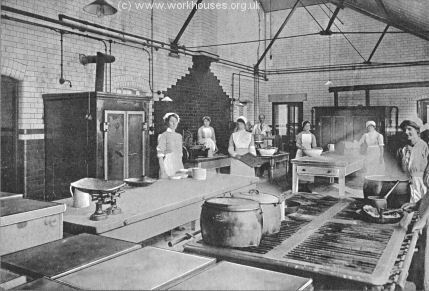 Each ward had kitchens, scullery and stores, but no separate duty room for staff. Toilets and bathrooms for the patients' use were placed at the far end of the main ward in angled annexes, in between which was placed a sun balcony. 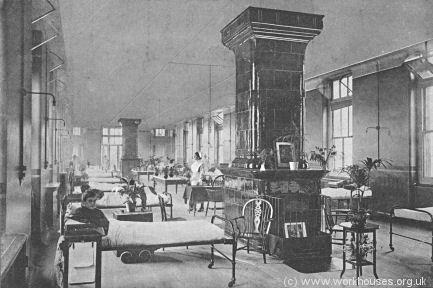 Park Hospital diphtheria ward interior, c.1908. Park Hospital diphtheria wards, c.1908. Park Hospital scarlet fever ward patient reception, c.1908. 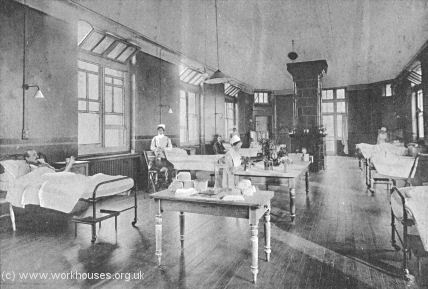 Park Hospital tuberculosis ward interior, c.1908. Six isolation blocks were provided, with four placed in a row at the south of the scarlet fever wards, and the other two at their east. These two-storey buildings were essentially miniature versions of the main ward blocks and included the same sanitary annexes and sun balcony. 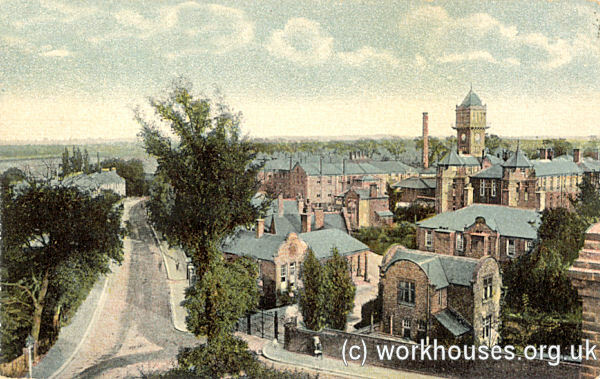 Park Hospital ward blocks, 1897. A nurses' home, a long three-storey building in three sections, lay to the south of the site, at its highest point. Laundry and workshops occupied the south-east corner. Water for the hospital came from wells dug into the underlying chalk and was pumped up through water softening apparatus for storage in a tall water at the centre of the site. A detailed description of the buildings appeared in The Builder in August, 1896. THE PARK HOSPITAL, HITHER GREEN, LEWISHAM. On Monday the Prince of Wales, accompanied by the Princess and Princess Victoria, opened the new fever hospital at Hither Green, Lewisham, which will be the ninth hospital under the management of the Metropolitan Asylums Board. The building is situated on an elevated site (the highest in the district) near Hither Green Station, on the South-Eastern Railway, about three-quarters of a mile from Lewisham and six miles from London Bridge. The average level is about 95 ft. above high-water mark, there being a difference of over 30 ft. in altitude from east to west, and of 23 ft. from north to south. The "infected" buildings are generally about 100 ft. from the boundaries of the site. The site consists of 20 acres of ground. The hospital is intended for cases of scarlet fever, enteric fever, and diphtheria, and the accommodation is as follows :— Scarlet fever, 48 wards for 368 patients ; diphtheria and enteric fever, 24 wards for 120 patients; isolation wards, 36 wards for 60 patients. The disposition of these is shown on the accompanying block plan — the scarlet fever wards lying to the right, the diphtheria and enteric fever wards to the left, and the isolation blocks to the rear of the former. The pavilions are disposed on a roughly radial plan, and are connected by covered ways with the kitchen, steward's stores, water tower, dispensary, and telephone exchange, all of which are in the centre, together with the male and female servants' residences, the latter facing the road. As the receiving rooms for the different diseases are at the outer or zone ends of the respective covered ways, the danger of patients suffering from different diseases coming into contact is very remote, all direct source of contagion being thus kept away from the central block, to which tradesmen and others have access. The nurses are located on the summit of the site, having to the south of their homes grounds where they may get rest and recreation away from the sight and sound of their work. To the south-east are placed the laundry, the boiler and engine houses, workshops, disinfecting house, well and water-softening apparatus. The medical superintendent's house is near the entrance and the offices. 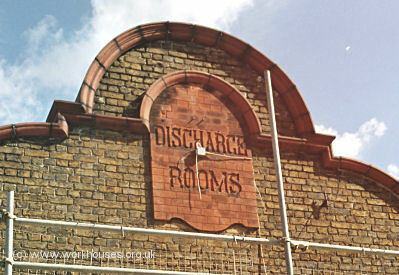 The discharging rooms, mortuary, post-mortem rooms, &c., are close by. The assistant medical officer's house is near the diphtheria pavilions, and the steward's house commands the entrance to the stores and kitchen yard. The number of staff for whom accommodation has been provided is 316. All pavilions are axially nearly north and south, and are two-storied, with fire-proof and sound-proof floors. There is no internal communication between the two stories — the upper floor being reached by an external staircase opening front the covered ways. Lifts are provided at each staircase for coals, food trolleys, &c. A scarlet-fever pavilion contains on each floor three wards — one for twenty beds, one for two beds, and one for one bed — a ward scullery, and other offices, the scullery being fitted with hot-plate kitchener, sink, &c. There are also provided a bath-room, two water-closets for patients and one for staff, sink-room, two bed-pan slop-sinks, lavatories, movable baths, &c. In addition to hot-water radiators, there are central open fireplaces and stacks of flues. In these central stacks every smoke-flue can he swept from the external basement. The smoke-flues are surrounded by aspirating-flues, which, being thus heated, induce an up-current, and so draw off the heated vitiated air from the centre of the wards. 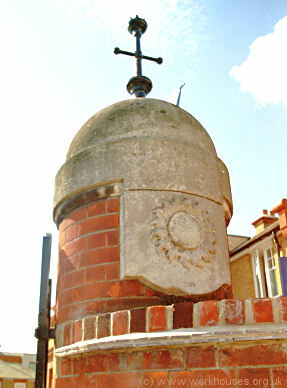 In each stack (which is externally made of glazed faience) are eight of these air-flues and four smoke-flues, and the whole are contained in an area 3ft. 6in. square. All these air-flues can be swept, and all have outlets on two sides. Throughout the pavilions there is not a single buried pipe or inaccessible space of any kind. The linings of the sash-windows are made to open for sweeping. Weights and sash-lines can be removed and renewed without taking out the sashes. In some of the buildings is a new type of sash-window, designed by the architect. There are no hollow linings, the frame is solid but the sashes slide up and down. In addition, they are made to open inwards to throw the air upwards. They can be regulated to any angle, and can be opened to admit air through the full area of the frame — i.e., double the area of an ordinary sash-window. For "scouring" a ward this is of value. They can also be cleaned, painted, and reglazed from the inside. The mode of securing these sashes is by a fastener on the bottom rail, avoiding the necessity in high windows of steps. It also enables the sashes to be made rigid, so that they cannot rattle in a wind. In one of the wards ordinary hollow sash-frames have National Accident Prevention Window Company's sashes, which are hung on centre pivots, and are similarly accessible for cleaning, painting, and reglazing front the inside. The water-closets used are of the bracket type, fixed clear above the floor, which can thus be kept clean. The main waste from the baths is an open trench in the floor. Attached to the pavilions at both ends are airing balconies to which the beds can he wheeled for "sun" baths, and every pavilion has its own airing-court. The laundry — divided into two parts for patients and staff respectively — is a long rectangle. Soiled linen enters at one end and passes through the several cleansing processes to the distributing-room at the other. The disinfector is at the entrance to the laundry-yard, and is fitted with a Lyon's apparatus. The boiler-house is partly under the laundry. There are four large boilers with "Economiser" connected to the furnace shaft. The engine-room contains laundry-engine and the electrical plant of three engines and dynamos for lighting the hospital. The hospital is to be supplied by water taken from the chalk, and the wells are now being sunk. The water will he pumped into a softening apparatus alongside, and thence to the water tower and the various other storage tanks. The water-tower forms a central feature, and contains a four-dial clock, visible from all parts of the premises. The kitchen-block is a one-storied building, the walls internally faced with glass. Close by are the larder (also faced internally with glass), the steward's stores, and all the servants' homes, &c. ; this group enclosing a large yard. The female servants' block contains a separate cubicle for each maid, large mess and sitting rooms, and offices. The matron's quarters consist of a separate "flat" in the same block. The male servants are similarly housed on the opposite side of the quadrangle. The nurses' home is divided into three houses, connected with glass and iron corridors on every floor as an additional means of egress in case of fire. 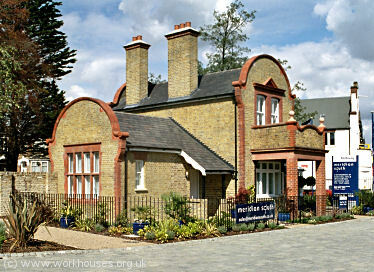 Separate dining and sitting rooms are provided for charge and assistant nurses, and a common writing and reading room. Each nurse has a separate bedroom. In these residences, as well as in the fever pavilions, all water-closets, lavatories, &c., are in detached towers, approached by enclosed passages, so that every building is practically separated from its sanitary annexe. All annexes are warmed, and hot water is laid on to baths and lavatories. There are telephones in the various buildings, and from anyone an official can communicate with every other building throughout the hospital. Fire hydrants are fitted throughout the buildings and in the yards, and fire-alarms in every block communicate with six alarm bells in various parts of the hospital, while a special arrangement is made to call all the staff together in emergencies. It has been already noted that covered ways connect all parts. These are of brick and concrete. The floors and steps are of red granolithic concrete. Under all these covered ways are well-lighted subways in which are fixed the water and steam mains and heaters, electric light, telephone and fire alarm cables, &c., all accessible at any point for repair. The heating of the hospital is carried out on the low pressure hot water system, the heat being generated separately in each pavilion by means of one of Messrs. Z. D. Berry & Son's improved multitubular heaters, fixed in the subway at the point where each pavilion branches from the main corridor. A flow and return main is then taken off the heaters, and run right round the walls of the pavilions under the ground floor, and vertical pipes are taken from this main to supply the radiators on the ground and first floors, a separate pair of verticals to each radiator on each floor. Steam is conveyed from the boilers to each of the heaters, and the condense water from each heater is collected into a condense main and taken back to the hot well in the boiler-house, and thence pumped back to the boilers. The wards are heated by means of radiators fixed in cast-iron cases. Behind each radiator are two large fresh air inlets fitted with cast-iron hit and miss gratings, and coupled together and connected with a lever taken to the top of the radiator case, so that the quantity of fresh air may be regulated ; the fresh air is then warmed and discharged into the wards through a large hit and miss grating constructed in the top of the radiator case. The radiator cases have been specially designed to meet the requirements of a fever hospital. Each case is fitted in the front with a large pair of doors which are opened with a key so that the interior of the case and the radiators can be dusted out and thoroughly cleaned by those in charge of the wards. In the bottom of each door is provided a hit and miss grating, which in very cold weather enables the air in the wards to be circulated through the radiator. The hot water which supplies the baths, lavatories, sinks, &c., is generated in a multitubular heater similar to those used for the hot water heating (one for each block), and a flow and return main is run by the side of the main for heating, and branch loops are taken off to supply the various fittings. All branch loops are in circulation. The whole of the horizontal pipes and valves are so arranged that they can be attended to and examined without the engineer having to enter the wards. There are sonic six miles of pipes within the area of the hospital. The various diseases are kept separate in the drainage scheme, and all "non-infected" drains are kept distinct from the others. The manholes or inspection chambers are of solid glazed fire-clay (Border's patent), the bottoms and all the branches being cast in one piece. The pipes are of the Archer jointed type, laid on and covered with concrete. The whole pipe system is divided into separate lengths for efficient ventilation, and all drains are fitted with flushing tanks. The architect of the hospital is Mr. Edwin T. Hall, and his design was selected in competition. Mr. Turner has acted as chief clerk of works, and Mr. Mansell as assistant clerk of works. In the special electrical work Mr. Wray was clerk of works. The electric scheme has been designed and supervised by Messrs. Burstall & Monkhouse, civil engineers. Mr. Dolby, C.E., has advised on the mechanical engineering throughout, and has supervised the erection of the boilers and machinery. The contractors were Messrs. Leslie & Co., Limited, of Kensington. The contract sum is 210,000l., a little less than the architect's estimate. The work has been carried out under the personal supervision of Mr. Shingleton, Managing Director of Messrs. Leslie & Co., assisted by his manager, Mr. Kitchener, and the general foreman of the works, Mr. Easter. 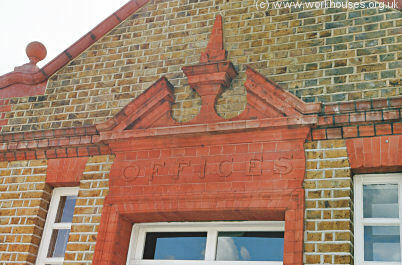 Messrs. John Hall & Co., of Stourbridge, supplied all the ivory-coloured glazed bricks used in the building. Messrs. Colledge & Bridgen made and supplied the locks, lock furniture, and brassfoundry work. 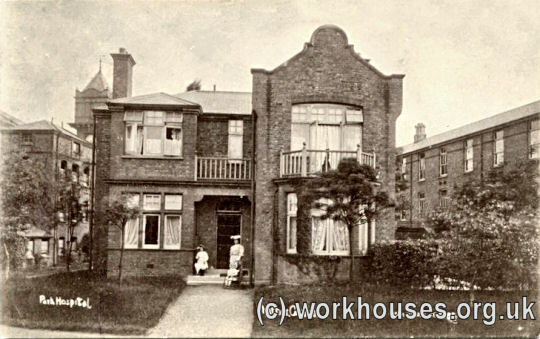 Park Hospital - Steward's House, c.1905. 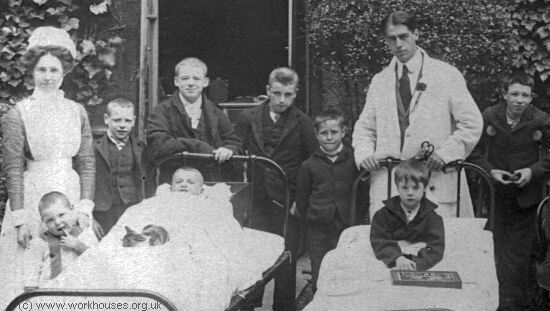 In 1910, following the general decline in the numbers of fever cases, it was decided to close the Park Hospital and reopen it for accommodating sick children from London's workhouses and workhouse infirmaries. The buildings were completely disinfected, renovated, and the hospital reopened on November 19th, 1910, by the Right Hon. J.Burns, President of the Local Government Board. In 1930, administration of the hospital passed to the London County Council. 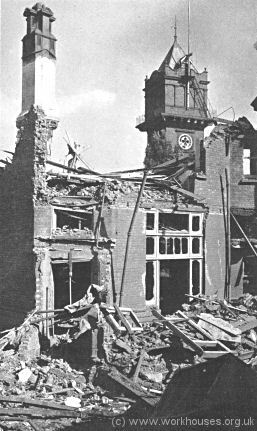 During the Second World War, the site suffered severe bomb damage. In 1948, the hospital joined the newly formed National Health Service, then in 1957 was renamed Hither Green Hospital, and specialised in the treatment of psycho-geriatric patients. The hospital closed in its centenary year in 1997 and the site has now been redeveloped, with just a few buildings around the entrance being preserved. Park Hospital site from the north, 2004. Park Hospital porter's lodge from the south-east, 2004. 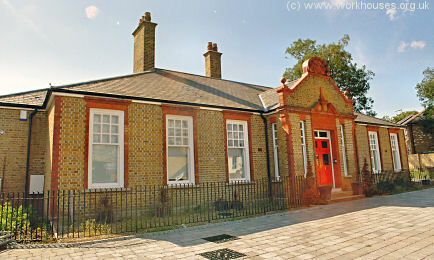 Park Hospital entrance offices, 2004. The Builder , 17th July, 1897.